The U.S.S. Enterprise is assigned a delicate diplomatic mission. The starship must ferry the ambassador from Troyius, Petri (Jay Robinson), and the barbaric Dolman of Elas, Elaan (France Nuyen) on a slow cruise to Troyius. During the mission, Petri will gloom the difficult Elaan for life on Troyius as the bride of the Troyian leader. At stake are the peace and stability of the star system that houses both worlds. Making the journey difficult, a Klingon D-7 cruiser shadows the Enterprise’s every move. 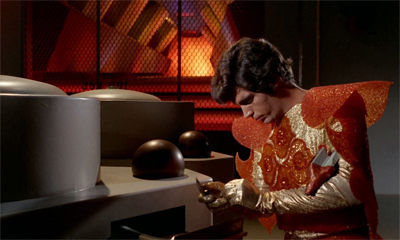 Soon, Elaan attempts to murder Petri, leaving Captain Kirk (William Shatner) to step in and complete the ambassador’s attempts to make the impulsive dolman ready for polite culture. His efforts are complicated by Elaan’s tears. These tears act like a kind of “biochemical” love potion, and Kirk is soon impacted by them, his thoughts clouded. As Kirk battle with his feelings for Elaan, a traitor sabotages the Enterprise, and he and Spock (Leonard Nimoy) must determine why the wedding/alliance is of such importance to the Klingons. “Elaan of Troyius” is a controversial entry of Star Trek’s (1966-1969) third season. 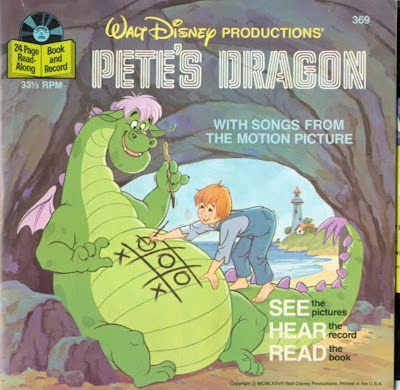 Written and directed by John Meredyth Lucas, the episode features action and humor aplenty, and is based on many literary sources. It endures, finally, as a statement regarding Kirk’s strength of character (and superhuman?) resolve. The central problem, of course, involves the fact that the episode -- to our eyes in 2017 -- plays as abundantly sexist. At one point in the action, Kirk notes that Spock’s planet (Vulcan) is the only world in the galaxy that can make the claim that it possesses logical women. That remark is sexist on its face. The overall plot -- that a woman must change her entire life and culture, to exist in polite society (and please a man) -- similarly might easily be interpreted in this fashion. However, I do resist this interpretation, and would encourage others to do so as well. 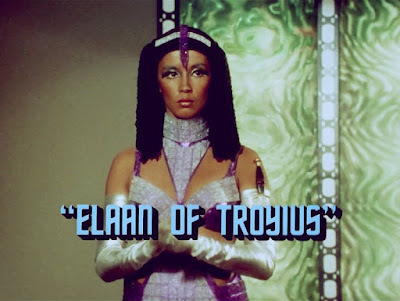 Facts are facts: “Elaan of Troyius” was produced nearly fifty years ago. Thus it arose from a completely different historical context than the one we deal with today. Accordingly I don’t necessarily see the benefit or wisdom of judging a half-century old work of art by today’s standards, except to note that the episode appears, in 2017, out-of-date in terms of its approach to gender. Context -- the setting around the work of art -- is crucially important to any fair-minded assessment and understanding of that work of art. What remains so amazing about Star Trek is the fact that it so often was ahead of its time (and still is…). That remarkable fact actually makes the more overtly sexist shows (“Mudd’s Women,” or “Elaan of Troyius”) seem doubly disappointing, I suppose. Star Trek gets so much right, so much of the time, that when it gets something wrong, it sticks out like a sore thumb. “Elaan of Troyius,” to some eyes, reflects the time the episode was made, and not the enlightened era the stories are supposed to represent (the 23rd century). But why re-litigate a work of art from fifty years ago by today’s beliefs? I fear very few works of art would pass such a test. This is why I do not favor, as I have written before, the application of the Bechdel Test to productions made decades ago. What’s the point of doing so? Decades ago we hadn’t made the progress we have made now. Are we supposed to shun works of art that, made fifty years ago, don’t pass today’s benchmarks? That’s what I fear could happen. I would hope that all of us can acknowledge that yes, aspect of this episode are quite sexist by today’s standards, but, simultaneously, that the episode wasn’t made in our modern environment, either. We can acknowledge the sexism, without judging the creators of the episode, or the episode itself, harshly. So the question we must address about this episode explicitly involves Elaan. I fully acknowledge that Kirk’s line of dialogue about women is sexist, but is the depiction of Elaan sexist, overall? Well, one could make the argument that it is not. After all, Elaan embodies the high ideal of self-sacrifice for her people, choosing to live in marriage with a person she has every expectation she will despise. This act of sacrifice actually saves two planets: Elas and Troyius. This action proves that Elaan is not a prop or a pawn, but a remarkable leader. This is not to claim that Elaan is a saint. She knowingly seduces Kirk. She attempts to murder Petri. She recommends the wholesale destruction of her enemies. These are not the actions of an enlightened ruler. But in the end, Elaan follows through on her promise; on her duty and responsibilities. I think it is too much to ask that she not entertain other possibilities, or that she “like” her destiny. That seems sexist in its own way. The distasteful aspects of the episode -- Kirk’s line about women, which is a stereotype since it does not acknowledge or recognize women as individuals, and his slapping of Elaan -- are present here, no doubt. Kirk also threatens Elaan with a spanking. I’m not an apologist for these moments, excusing them, or wishing them away into the corn field. They exist because of the context of the late 1960’s and because of the literary sources underlining the episode. The Taming of the Shrew, first written in the 1590’s, is about a man, Petruchio, who bends a non-compliant woman, Katherina, to his will. He basically breaks down her individuality, freedom, and identity to make her suitable. 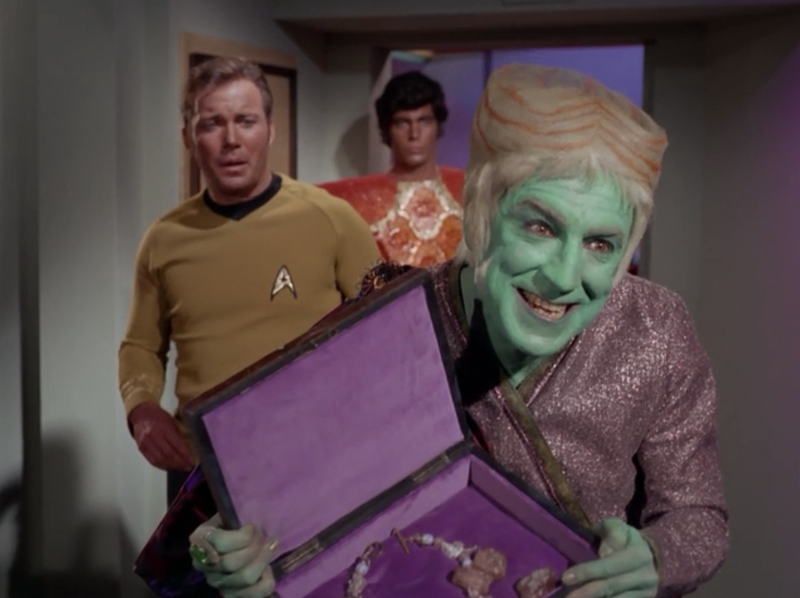 “Elaan of Troyius” casts Kirk as Petruchio, and Elaan as Katherina, but with a unique difference. Kirk only reluctantly, and under orders, comes to the task of “preparing” Elaan for her new life. And Elaan, in adopting alien customs, prevents war, and perhaps the annihilation of two cultures. The stakes are huge, here, and both characters act in a way beyond the “self,” or above any overriding desire to conform to social norms. Kirk and Elaan act as they do -- in much the same way as their literary counterparts -- in other words, for peaceful, enlightened reasons. The title of the episode, “Elaan of Troyius” is a lame, on-the-nose riff on the Helen of Troy story (The Iliad), and that work of art is another sexist tale, perhaps. Helen is a prize in that tale; one that is stolen, and one that must be reclaimed. She is the cause of a great war, not the resolver of a war, so that’s a key difference too. I would argue that Elaan actually possesses a great deal of agency, because, in the end, she chooses a path that will benefit Elas, Troyius, and the Federation, even if is at her personal expense. This is the strong aspect of the episode. The weakest aspects see Elaan acting like a child, not an adult. The innuendo is that all women are children who must be set right, at any cost, by a strong adult man like Captain Kirk. Perhaps the best way to view Elaan, in this episode, is as a space-age Cleopatra. The historical Cleopatra is remembered as a wise ruler who, through her careful alliance with Rome, maintained Egypt’s independence from Rome for a lengthy duration. She maintained the prosperity of her country by managing its economy and currency, and is believed to have been a true renaissance woman, with an intense interest in the arts, as well as science. The character Elaan, who we meet at the start of this episode is a savage, it seems, in terms of personal behavior (table manners, anger management) but like Cleopatra, she becomes the focal point of Empires (the Federation, Elas, Troyius), and through her actions stabilizes an entire sector of space, likely for years. So is the sexism of “Elaan of Troy” a disqualifying aspect? Or is the exploration of two leaders -- joined by a duty that robs them, in a sense, of relationships and connection -- enough to overcome the sexism? I can’t make that call for you, or anyone. Mileage will vary. I will note that, personally, I typically find Star Trek: The Next Generation much more sexist, in some important ways, than the original series ever was. There, in the 1980's -- a full two-decades later -- the primary female characters (Dr. Crusher and Counselor Troi) were both care-givers, and still breaking crockery on enemies' heads instead of using phasers, or hand-to-hand training...as late as the fourth season). Both characters were defined, early on ("The Naked Now"), for their hidden lust for the leading men (Picard and Riker). There are two aspects of the episodes, beyond the gender issue, that are really terrific. The first is the humor. The moment here -- in which Spock and McCoy intrude on Kirk and Elaan locked in a passionate embrace – is hysterical, and the humor stems from character. Spock and Bones know well Kirk’s reputation as a lady’s man. Finally, the episode's final battle with the Klingons is tense and well-orchestrated, a dramatic high point. Your points about 'a different time' are spot on. "Star Trek: the Next Generation" is almost unwatchable. In so many ways -- not just the gender attitudes -- that show feels older than the original. You write with great elan, Sir. Yes, she has terrible manners. I put that down to her culture, or perhaps a culture in which the high need no manners because they are high. Certainly the rich and powerful of today can get away with a lot that the regular Joe can't. As for her attitude, I see it as her doing her duty -- but only her duty and no more. She'll get married because she knows it's best for everyone, but refuses to change her identity for it. And that's the sexist part -- that marriage demands that she change her identity. 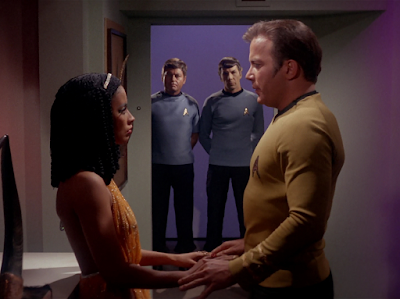 So, aside from Kirk's comment, I guess I see the episode as a roundabout condemnation of 60's marriage values. "Elaan of Troyius" is one of those episodes that grew on me: I liked it well enough as a kid during the first run but have found more to appreciate about it over time. One tends to forget just how much action there is in it. Yes, it should be viewed within its context. I'm a woman and a (not particularly strident) feminist, but I am absolutely sick to death of the constant finger-pointing and couch-fainting over relatively minor details in older works of art. Note it as a minor detail in passing, fine; but to critique and relitigate every single instance of sexism ex post facto becomes tiresome and silly. Furthermore, I must draw attention to the fact that despite the rise of feminism and the E.R.A. in the 60's and 70's, stereotypes about women--many of them perpetuated *by women*--persisted in television and popular culture, like bad women drivers, women who couldn't balance a checkbook, etc. If one can't view an episode of The Honeymooners ("To the moon, Alice . . .!) or even, say, The Carol Burnett Show, without getting the vapors over stereotypical situations, then one ought to avoid all older works of art lest they be found wanting. Especially literature. What a well-crafted episode this is, with terrific battle sequences, Klingon (Romulan) battlecruisers, Orions, saboteurs and intrigue, and murder to go along with the more personal story. Once again, every dime that could be spared ends up on the screen: the Troyian guards look great even if they are wearing placemats! And the score for this episode is one of the very best scores ever from a show that, pound for pound, may have been the best-scored television show ever. There isn't much to complain about here. I've always liked this episode and never once thought of it as an exercise in sexism. You've dotted every "i" and crossed every "t" in your examination of it, but I've always found it to be a fun romp with an exciting space battle. Isn't it implicit that a series from the 1960's, as ahead of its time as it was, isn't going to get everything right? For comparison's sake, I've been watching episodes of The Monkees on blu ray, and Good Gosh, some of those shows have elements that make me cringe now. Certain things were just accepted back then, but we've grown up since and we know better. At least Star Trek was trying its best to pole vault over a bar that was much higher than its contemporaries, and is even higher still today. I think it's great that we've made progress, but we still have a long way to go to towards Utopia. As for "Elaan of Troyius," I accept it for what it is and not what it should have known it could be. It's another episode that destroys the credibility of those who malign and mock The Third Season. Plus, it earns extra points for having the one and only Doctor Shrinker in it. Young Steve appreciated that as much as Steve Mark 2017 does. Speaking of Dr. Shrinker, I have to say Jay Robinson was exactly the kind of actor, and gave the kind of performance, that Star Trek deserves kudos for casting. Anyone who saw The Robe--wherein the director lost control of everything--(you KNOW you have a major problem anytime Victor Mature is acting parabolas around Richard Burton, who's doing his impression of a block of granite)--and its sequel, Demetrius and the Gladiators, knew that Jay Robinson was going to flame the Flaming Flamer of Flamedom onscreen! The Star Trek producers knew what kind of performance he was likely to turn in and yet he was cast anyway, and gave the expected performance, and in some ways that is the least remarkable aspect of this episode! It's exactly the sort of casting and the sort of performance that TNG absolutely ran from. I would go even further than John in my contempt for Gene Roddenberry and his successors at TNG, who paid lip service but did absolutely nothing to advance TNG or later incarnations of Star Trek beyond--or even to--the limits of the cultural landscape of the time. 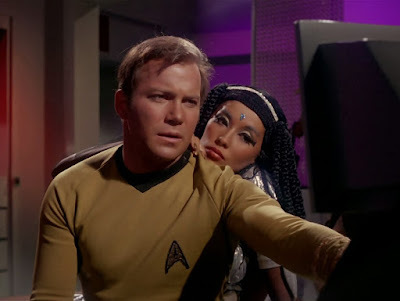 I give Star Trek TOS all kinds of breaks for any errors it made in the service of taking risks to advance ideas that clearly were beyond its cultural milieu. I am contemptuous of TNG because it took zero risks, did even LESS in a time when the cultural milieu was advancing past it and overtaking it, and it didn't even have the excuse of network brass interference as TOS did.